Grosgrain: Burlap and Blue $30 Gift Card GUEST GIVEAWAY!!!! CLOSED. Burlap and Blue $30 Gift Card GUEST GIVEAWAY!!!! CLOSED. I've seen so many lovely things on blogs. Some things I would have never thought to desire until I saw them in such a fine light. Dessert pedestals fall in this category. If you have a love of elegant niceties check out Burlap + Blue. If you also fall in love with one of her dessert pedestals, among other things, enter to win a $30 gift card to her store. 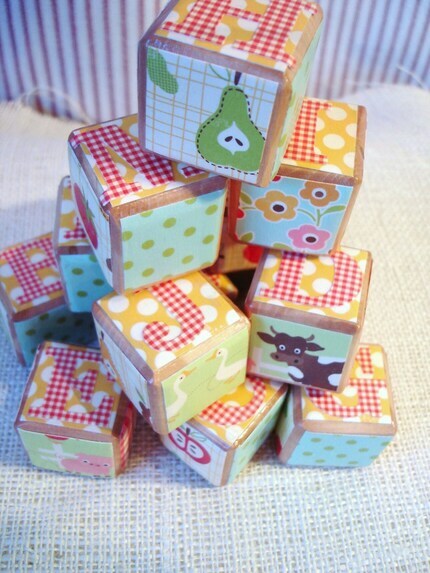 These adorable Wooden Matching Game-Set of 16 Tiles (Amy Butler Designs). would make a darling holiday, birthday, or 'just because' gift for the little ones in your life! These coasters are a little bit vintage, a little bit modern, Perfect as a holiday, birthday, or hostess gift! Linda's focus is on vintage-inspired goods for your home and family. If you have any questions, or want a custom order, please convo her. If you like what you see here, don't forget to check out her blog Burlap and Blue. Oh so fun! Would love to win this! Oh...looks like so much fun!!! Oh, fun! That matching game would be perfect for my niece! Thanks for the chance to win. Wow, very cute. Love the patterns! These are great! I could find some great gifts there! love it! just posted a link!! Ooooh! I'm going to have to check her out. I'm linked on fb. I LOVE those dessert pedestals! So many cute things. And thank you for simplifying the entering. I was one who has enjoyed lurking on the blog, but don't necessarily love the linking requirement. So thanks for the chance (however outside it may be) to enter without linking. Everything is so cute, what a great giveaway! Those dessert pedestals are sooo cute!! Those pedestals are SO gorgeous! wow...great stuff! pick me, pick me! Her store is so cute - I love all her different pedestals! What a fun giveaway! My little daughters would LOVE those blocks and my best friend would LOVE those coasters! Thanks for always finding/making/etc. the cutest things for giveaways,I'm in. All of her stuff is SUPER cute! I especially like the blocks! love Amy Butler-- those tiles are great! The Amy Butler tiles are very nice. Thanks for hosting the giveaway! Those dessert plates are the best! love those blocks and what a great way to learn matching & patterns. Hi! Thanks for visiting my blog! I love the dessert stands, and the coasters, and the blocks! I hope I win! And I linked to you on my blog! Love the dessert pedestals shown! They look so classy!! Absolutely lovely! I'd love to win! Please enter me, I would love to win this. I would love to win this! love the blog! Thanks for doing this giveaway! I just love reading your blog, and also love it since you've made entering your giveaways a little more simple! Thanks again! Beautiful shop btw. Love the cake stands! I love the dessert pedestals, would love to win this. just linked to my blog too. thanks. I am loving the dessert stands! A vintage one especially caught my eye...hope I win! I love her dessert pedestals!! Thanks for the chance! What great products. Thanks for sharing insights and for holding this giveaway. Delightful. The cake stands are SO cute!!! The dessert pedestal and those little blocks are so adorable! oh those blocks! they are so beautiful and i would love a set for my newest little one! These are incredibly pretty - I would love to be entered. These are quite lovely! Fun stuff! Adorable! Love the vintage style. I totally want a dessert pedestal. They have such nice stuff!! The colors are so refreshing for all of these items, a common thread... so cheery! I'm delighted that I found this site! Love these! Hope I can win the gift card. What fun! I love the tiles and the serving dishes. So cute! Hope to get the card! I would love to with a gift card to spend at your shop! Pick me! 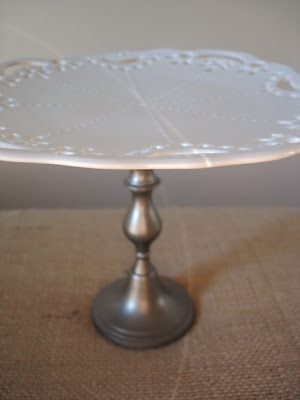 Love the Vintage Mod Black and White Dessert Pedestal-I have always wanted one of these! Dessert pedestals are so lovely! No, if I won, I could not give it away for Christmas. These are so cute! Would love to win! How fun! Love all the photos! What a great giveaway. This stuff is so fun. I love those cake stands are adorable! tons of cute things in here! How cute! I would love to win something nice for the new year. I'd certainly love to have one of those dessert pedestals! So cute! So cute! Thanks for doing the giveaway! Love the coasters. Very elegant. So cute! I hope I win. I linked too. 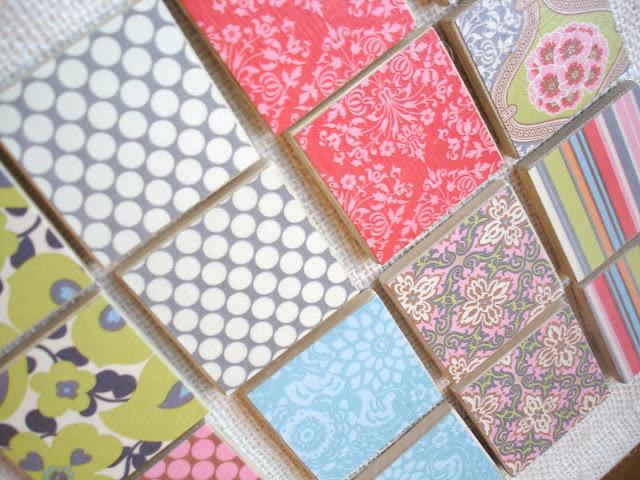 I LOVE the Whimsy and Lace Ceramic Tile Coasters! Sooo cute! Cute pedestals! I'd love a chance to win. Please enter me~I would love to win!! 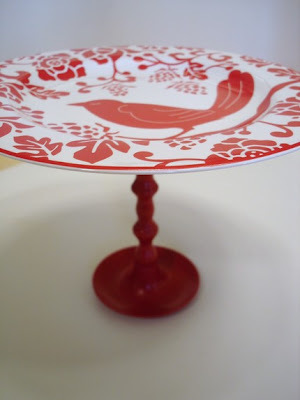 The red bird plate & pedestal shown on your blog entry had me flying to her site to see if it was available! Sadly, no, but I've favorited a couple other items. Oooh! This is so gorgeous! Thanks for the chance to win! I love the cake plate! They are all absolutely lovely!! Oooh - count me in. Those coasters are lovely!!! I'm in love with those cake stands! I have seen so many dessert pedastals this holiday season in blog world that I've decided I want one!! Love the range of coasters & dessert pedestals. Would be so hard to choose!!!! I hope that I am lucky enough to win. Too cute. Thanks for introducing us to such fantastic shops. Those cake plates are stunning. Everything's so cute! 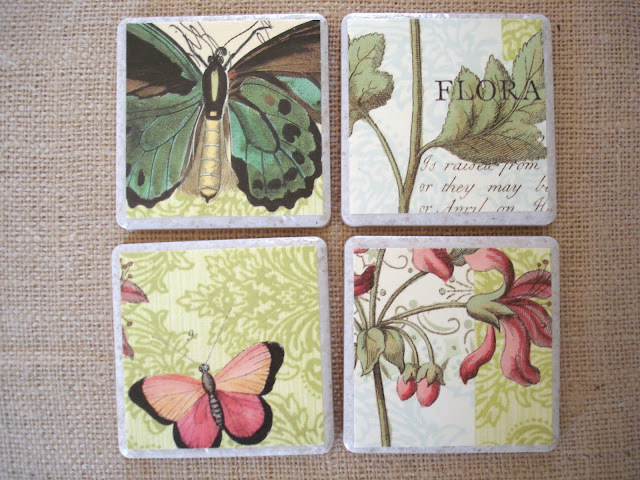 I especially like the Vintage Butterfly and Floral coasters!